the group's distinctive diagonal yellow and black "tiger stripe" tail markings. This site provides a communications point and information source for members of the 387th BG and their families. All veterans, families and devotees are invited to use the site and asked to submit new information, photographs, comments and corrections. Arrangements have been made to preserve this site in perpetuity so that it can serve as a reference for future generations. The 387th Bombardment Group (Medium) was one of eight U.S. Army Air Force B-26 equipped medium bomber groups deployed in the European Theater of Operations during World War II. Known as the "Tiger-Striped Marauders" or "Tiger Tails" because of the distinctive diagonal yellow and black stripes painted on the tails of its aircraft, the group was comprised of four tactical squadrons: the 556th, 557th, 558th and 559th Bombardment Squadrons, Medium. The 387th Bombardment Group (Medium) was constituted on November 25, 1942, and activated on December 1 at MacDill Field in Tampa Bay, Florida. The group formed there and trained with the new B-26 medium bomber produced by the Glenn L. Martin Company. It rounded out its training with brief stays at Drane Field, Florida, starting April 12, 1943 and Godman Field, Kentucky, starting in early May. In late May the aircrews picked up the group's first 56 combat aircraft at Selfridge Field, Michigan, and spent four more weeks there and at other locations training, outfitting and and making some last-minute modifications to the new aircraft. On June 19 the air echelon left Presque, Maine for England via the northern ferry route, arriving on June 25. Ground personnel left Godman Field for New York on June 10, sailed on the Queen Mary on June 23 and arrived at the port of Clyde on June 29. 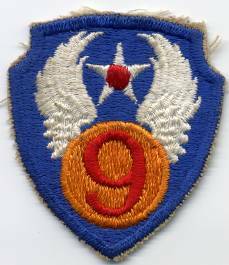 In England the group was first assigned to the Eighth Air Force, VIII Air Support Command, 3rd Bombardment Wing and stationed at a newly built-airfield near Chipping Ongar, about 20 miles northeast of London. The group flew its first mission, a diversion, on July 31 and its first bombing mission on August 15. The Eighth Air Force saw its mission as a strategic one aimed at destroying the German capacity to make war and thus wanted to focus on long-range missions against industrial targets deep inside Germany. Although the twin-engined B-26s carried the same bomb load and flew faster than the four-engined heavy bombers, they had a much shorter range. Accordingly, during its tenure with the Eighth Air Force the bulk of the group's missions were attacks on Luftwaffe airfields in occupied France and Belgium intended to relieve pressure on the heavies. In September 1943 Ninth Air Force headquarters arrived in England to assume the task of providing tactical air support for the invasion of Normandy. 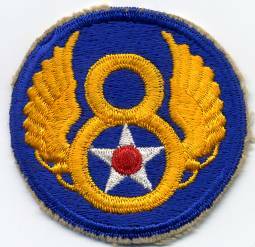 The 387th was transferred to that headquarters on October 16, and assigned to the IX Bomber Command, 98th Bombardment Wing (Medium). German construction of V-weapon launching sites targeting English cities presented a new danger, and in the winter of 1943-1944 a good deal of the group's attention was diverted to strike against such sites, both before and after they became operational. The group also participated in "Big Week," the intensive campaign against the German Air Force and aircraft industry involving both the Eighth and Ninth Air Forces, by hitting airfields at Leeuwarden and Venlo in the Netherlands in order to disrupt the defensive response to massed heavy bombers raiding into Germany. In May of 1944 the group's attention turned full-time to bridges, marshalling yards and coastal batteries in direct preparation for the invasion of Normandy; this included attacks on targets outside the actual invasion area to mislead as to the actual invasion site and disrupt the enemy's ability to move reinforcements to the true invasion site. On D-Day, June 6, 1944, the 387th bombed the defenses at Utah beach. Once the invasion was underway, enemy troop concentrations and strong points were added to the list of priority targets. For the next few months the 387th provided direct air support to allied ground forces by raiding railroad marshalling yards, bridges, road junctions, defended areas and fuel dumps. In July the 387th moved to Stoney Cross, an airfield close to the English Channel that had been vacated by a fighter group that had moved on to France, to be closer to the fighting. A month later it moved to France itself, the first medium bomber group to do so. Operating from a former Luftwaffe airfield near Cherbourg, the 387th participated in attacks on St. Lo and on German forces at Brest. As the front advanced the group followed, first to Chateaudun and then to Clastres; this enabled the group to have faster response times, deeper penetrations and multiple missions per day. By the fall of 1944 the group was conducting missions over Germany. At the start of the German counteroffensive known as the Battle of the Bulge the 387th, like the rest of the Air Forces, was at first grounded by bad weather. At the first break in the weather the group flew missions to disrupt German supply and support by hitting strongly defended transportation and communications targets at Mayen and Prum; its performance there earned it a Distinguished Unit Citation. As the Allied forces drove into the Reich, the group continued its mission by attacking bridges, communications centers, marshalling yards, storage installations, and other objectives in front of the advancing Allied Forces. The group launched its last combat mission on April 26, 1945; that mission was recalled three minutes from base because the intended target had been overrun by fast moving U.S. ground forces. The men of the 387th celebrated V-E day at their camp in an orchard near Maastricht, Holland. During its 21 months of combat operations, the group launched 396 combat missions. It delivered 16,280 tons of bombs onto enemy targets, in the process establishing an outstanding record for bombing accuracy. Nearly 100 of the group's aircraft were either shot down or damaged beyond repair, over 300 airmen were killed or reported missing in action and another 217 were wounded. The Army was reluctant to disband the group while war was still raging in the Pacific. Although aircrews with the longest service were released beginning July, the group remained together as a unit. After VJ day the sleek Marauders on which the crews had lavished so much attention were flown to a base in Germany and unceremoniously blown up. On November 4th, 1945, the group embarked on the U.S.S. LeJeune at Le Havre, France, for return to the United States. It arrived at Camp Kilmer on November 11, and within three days virtually all personnel had departed for separation centers. The group was formally inactivated on November 17, 1945. 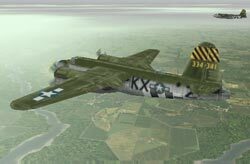 The role of the B-26 groups in the war in Europe is not as well known as that of the B-17 heavy bombers. This is partially because the heavy bombers had a strategic mission of their own while the B-26s flew to support the ground forces, partially because there were forty groups of heavies as compared to only eight groups of B-26s, and partially because the heavies flew deep into the heart of Germany and experienced much heavier losses. The two-engined B-26 medium bombers compared favorably with the four-engined B-17s--they carried the same bomb-load, flew faster and had a smaller size that made them less of a target. What the extra engines and larger wingspan gave the heavies was the ability to carry a lot more gas; their ability to get from airfields in England to Berlin and back is what gave them their strategic role. during Big Week, 20-25 Feb 1944, the intensive campaign against the German Air Force and aircraft industry. to the US in Nov. Inactivated on 17 Nov 1945. Activated 1 December 1942 at MacDill Field in Florida. Formed and trained there with B-26s. Moved to Drane Field on the 12th of April 1943 and to Godman Field Kentucky in early May 1943. The ground unit left for Port of embarkation on the 10th of June 1943 and sailed on the Queen Mary on the 23rd of June 1943, and arrived at Clyde on the 29th of June 1943. The aircraft flew via the northern ferry route to the United Kingdom in early June of 1943. Transferred to the 9th AF, IX BC, on the 16th of October 1943. Moved to Stony Cross in July 1944 and to France in late August of 1944. The unit flew tactical bombing missions in support of Allied land forces. The group was inactivated in the US on November 1945. The 387th Bombardment Group consisted of about 2000 men organized into a headquarters company, a service company and four bombardment squadrons. Although missions were assigned to and flown as a group, the men of the 387th identified most closely with their squadrons. Each squadron was assigned an identifying color; the prop spinners and propeller tips of the squadron's aircraft were painted in that color.Under USAAF Technical Orders a squadron was to be made up of a maximum of twenty aircraft, half of them operational ready and the other half on standby and/or undergoing required maintenance and service. The squadrons of the 387th were rarely at full strength. Each squadron had four flights, A, B, C and D.
After the Normandy invasion, the tactical air forces supporting Allied ground forces in Europe operated from forward air stations closely behind the advancing front. Aircraft operating from these stations could respond more quickly, spend more time over the battlefield and fly several missions on a day. In France, the prefix A was used for facilities initally assigned to the USAAF, B for those initially assigned to the British RAF. When the 387th moved forward an advance unit went first, the air and ground echelons followed a few days later and a final unit brought up the rear. Maurer Maurer (ed. ), Office of Air Force History, Headquarters USAF, Air Force Combat Units of World War II (Washington, DC: Goverment Printing Office, 1961, ISBN 0-912799-02-1). The Army Air Forces in World War II: Combat Chronology, 1941-1945, by the Office of Air Force History, Headquarters USAF, 1973. Distinguished Unit Citation, 23 Dec 1944. Meritorious acheivement while participating in an aerial flight; in practice awarded for participating in five combat missions. Awarded for each additional five combat missions.